This guide was originally created by me for the NLG1 guild on LINE chat. It has been ported to the Mobile Royale forums for the 'Think Tank' event and improved with pictures. I do not proclaim that my strategy is the best; it has proven useful for me and my guildmates and hence could aid beginners. Monster hunts - what are they and why would I do them? Monsters spawn randomly across the world and will stay there for a little while. Upon landing the final hit, your entire guild receives a chest. Hitting them also gives you some valuable loot, ranging from resource refills to runes and crystals. I therefore recommend hunting many monsters with your guildmates to prevent your stamina from filling up. You can head to the smithy and craft armor that boosts your damage against either fiends or icy crawlers. I personally don't use this, but it can definitely help you land a stronger hit against the monsters you encounter. Hunting villages can boost your monster hunt damage. You can find them around the world. If you capture one, you get a boost. Capturing two simultanously will, however, give you a bigger boost that you can even improve for an amount of time. There's a monster hunt boost that you can apply. It can be bought from the shop. I highly recommend switching this on if you're planning to hunt a lot of monsters in a short period of time. There's two types of damage and defense: physical and magic. Magical defense helps against magic damage. It's important to know what damage and defense types your enemies have - this can aid you greatly in defeating a monster using as few stamina as possible. There are currently two monsters in the game - the 'Icy Crawler' and 'Ifrit'. Each monster requires a different strategy. Whereas the Icy Crawler is an insect that deals magic damage, the Ifrit is a Fiend that deals physical damage. A more in-depth explanation on both monsters can be found below. The icy crawler is a magical creature with high magical def. It deals damage to anything in front of him that gets in his range. I therefore recommend using ranged heroes and deploying some melee powerhouses to prevent the crawler from reaching your rangers. Upon attacking this creature, I use two ranged squads and an infantry squad. You're also going to need to pick some reinforcements. 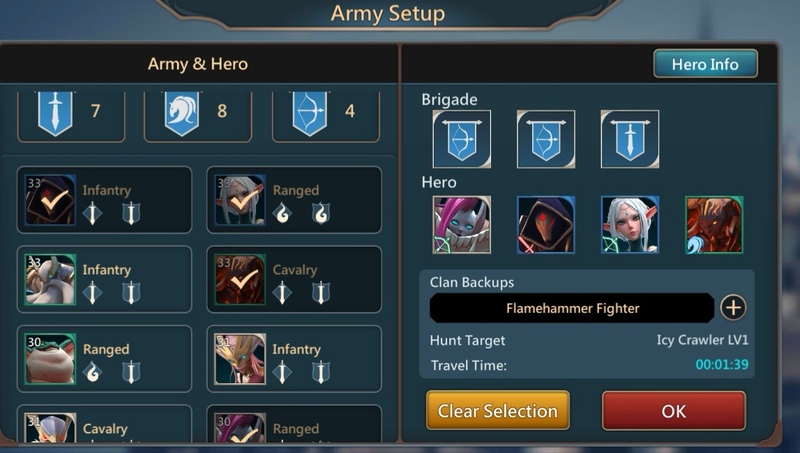 I'm personally using kingsdor reinforcements, but flamehammer and sunsinger are useable too. Since the Icy Crawler deals magical damage and has magical defense, it's wise to use heroes that deal physical damage and have some magical defense. I personally like Jezebel alot to hunt Icy Crawlers and usually use Saoirse, Branor and Omar alongside her. There's also a ruin that can aid you in hunting an Icy Crawler. For this, head to the Arcane Sanctum, press 'Ruins' and go to the 'Monster' tab. If you have enough Frozen Egg Shards, you could unlock the Frozen egg (if you haven't already). Just unlocking it already boosts your damage a little bit, but putting it on display is what you want to do for the best damage buff. Ifrits are fiends that deal physical damage as well as having physical defense. In order to defeat them, it's best to set your brigade to full cavalry. For reinforcements, flamehammers or sunsingers are recommended. If applicable, ranged heroes (such as saoirse and badaboom) are preferred. 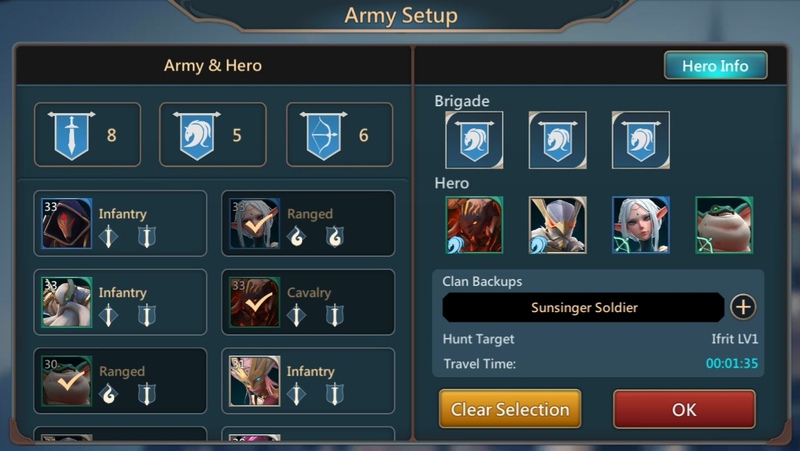 You can fill up the remaining slots with cavalry heroes such as Omar and Reginald. There's also an useful ruin that you can unlock early game. To use this, head to the Arcane Sanctum, press 'Ruins' and go to the 'Monster' tab. If you have enough Horned Alter Shards, you could unlock the Horned altar(if you haven't already). Just unlocking it already boosts your damage a little bit, but putting it on display is what you want to do for the best damage buff. If you need help with monster hunts, you can contact Ontvlambaar (NLG1 guild) in-game. I also have LINE chat; you can add 'Chazbennington' to contact me. I unfortunately haven't been able to get a hold of all heroes yet. Once I earn some new heroes, I will definitely expand on this guide. Nice post, exactly what I needed! Everything is better when you're a panda! I'm well aware of this but I do not have this hero at this time. She will be added once I get her. I've added Lorelei and the Steambeard gunners. Up next: Anthropos cavalry reinforcements and atlas. Guide updated with Steambeard gunner reinforcements and the hero Lorelei. Cheers.